"Maine' s first fatal military aircraft accident"
The aircraft was returning to Bangor from bombing practice at Langley Field VA and had last departed Westover Field MA after dropping off 8 enlisted men there. It was one of two ships flying loosely together, but under separate contact(VFR) flight plans. When the two aircraft arrived over Bangor, the first let down through the 1400 ft ceiling and landed. Lt. Beckham, Pilot on the accident aircraft radioed that he was having trouble locating a radio range leg to come in on. He then asked for the weather at Waterville and Old Town airports. He made a final transmission that the tower operator took to be "going to Portland". The Augusta tower called Bangor and confirmed that he had heard Beckham say he was diverting to Portland. About an hour later, the aircraft was seen flying around in the night sky over the towns of Lee and Springfield, 60 nautical miles northeast of Bangor. Three hunters at the Carry Farm, a section of high ground south of the towns, saw the plane pass over at very low altitude and drop a flare over the "Thousand Acre Bog" area, presumably looking for a place to make an emergency landing. The aircraft was heard circling and then a crash echoed through the night, with a large fireball being seen. The hunters tried to locate the wreck in the thick woods, but lost their fix when the fire died down. They walked out to town to report the incident. At first, USAAF personnel denied missing a plane since the aircraft had been assumed to divert to Portland, but an air an ground search was launched the next morning. 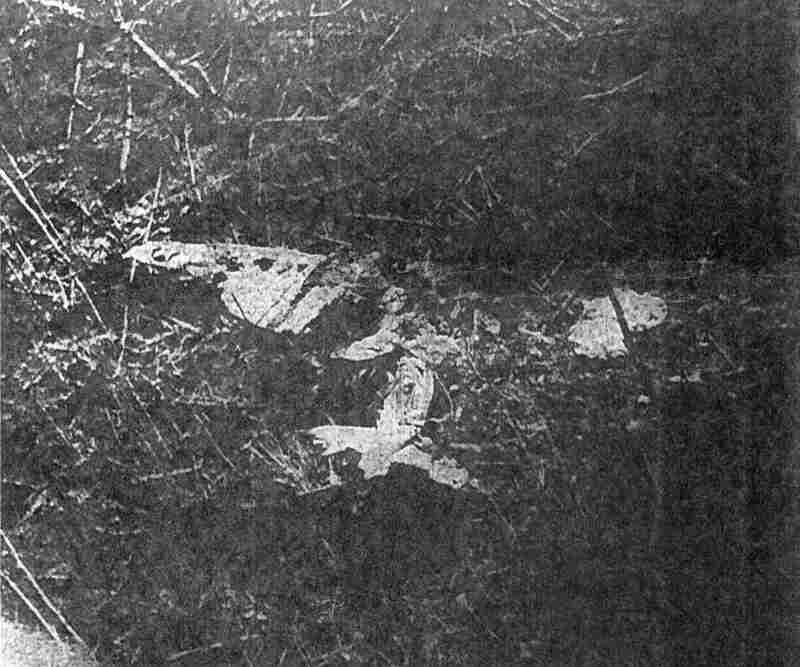 The aircraft was located on a small ridge, south of the bog. It appeared that Beckham had lined up with a burned over area, believing it to be a clearing and attempted a ditching. At the last moment, he saw the burned snags and throttled up into a left banking climb. The left wing struck a tree on the small knoll and the aircraft cartwheeled several hundred feet along the ridgeline, killing all four crewmen instantly. 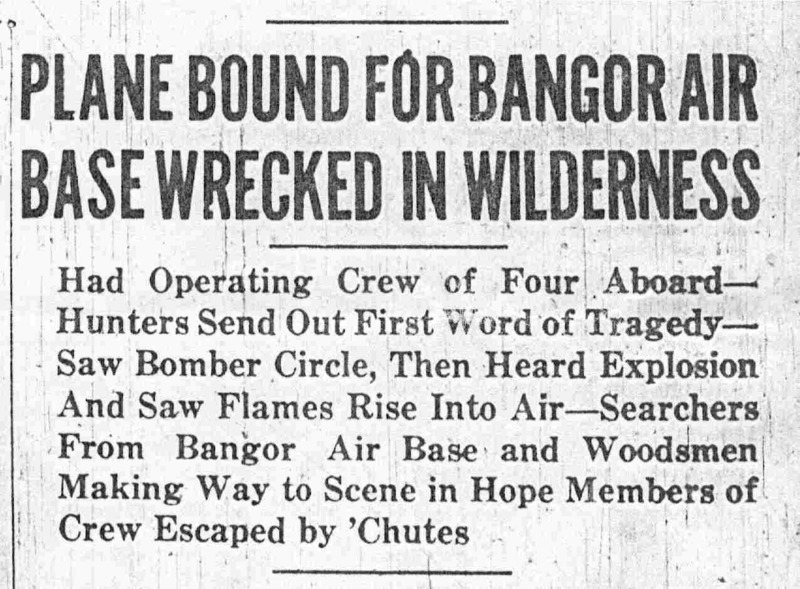 It is likely that the crew overflew the Bangor radio range beacon and picked up the signal on the rear of the antenna. This lead to a flight out over the woods north of Bangor, disorientation and fuel exhaustion. Killed in this accident were: 2Lt. Payton W. Beckham, Pilot; 2Lt. Wyman Thompson, Copilot; Cpl. Jacob L. Parson, Flight Engineer; And Pfc. Lee E. Rothermel, Radio Operator. Lt. Thompson had been involved in a landing accident (ground loop) at Bangor Army Air Field, with another B-18 just 19 days earlier. In a great twist of fate, the Radio Operator assigned to this crew was a resident of Lee Maine, close to the crash site. Pfc. Rothermel had swapped places with him at Westover because he had a date that night and his plane was laying over at Westover. 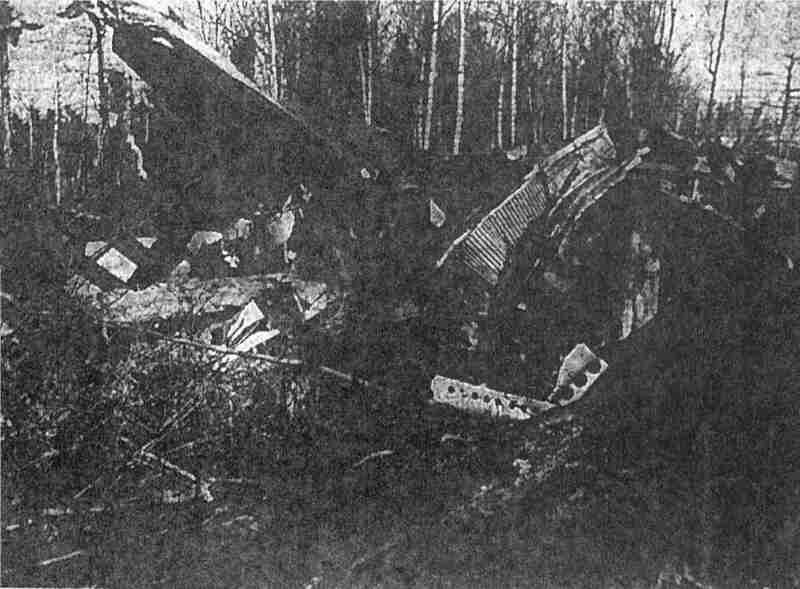 These two photos, taken the afternoon after the crash, show the wreckage of the B-18 from the air and ground. The forward fuselage was burned by the remaining fuel on board. The initial rescue team reached the scene via an 8 mile hike through some of the thickest brush in Maine. A trail was cut to a nearby stream and canoes were used to remove the crew and important material. In the summer of 1944, aviation engineer trainees from Dow (Bangor) Army Air Field removed the main wreckage as a training exercise. A road (long since grown up) was bulldozed into the site.